This is the coolest photograph I have seen all week. The angle is so original and the lighting is absolutely natural and whimsical. Such a beautiful mix here too with the Saarinen tulip table in marble, tulip chairs upholstered with a gorgeous green fabric and romantically beautiful and soft white drapes. 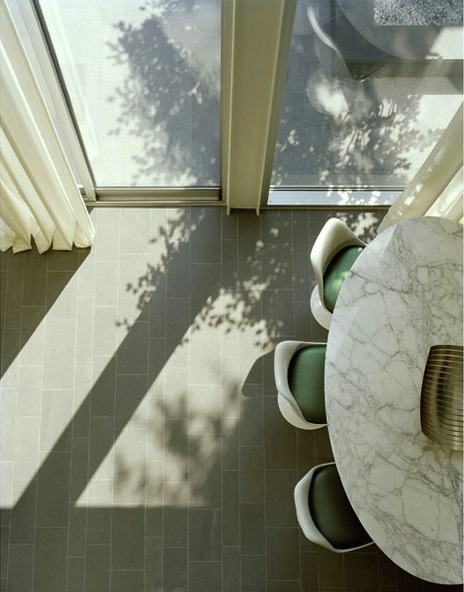 Beautiful simple grey porcelain floors. the green and grey-green is very soothing in that space. lovely light, too.